In this insightful collection, a broad range of scholars analyzes a core issue for socio-legal studies, what is understood by the \'socio\' of the \'socio-legal\'. Drawing from legal theory, cultural studies, and social policy, the collection\'s wide scope of themes and topics provides an important stock-take and analysis of the socio-legal field. 1. 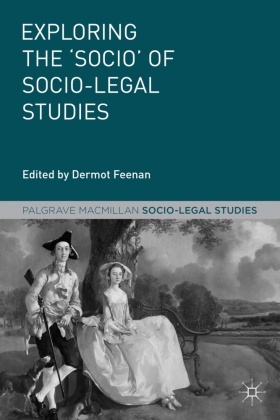 Exploring the \'Socio\' of Socio-Legal Studies; Dermot Feenan.- 2. What Makes a Social Science of Law? Doubling the Social in Socio-Legal Studies; Susan S. Silbey.- 3. The Contested Social; John Clarke.- 4. Law, Ethics and Socio-history: The Case of Freedom; Alan Norrie.- 5. De Lege Ferenda: What is the \'Socio\' of Legal Reasoning? ; Panu Minkkinen.- 6. Reimagining the Humanities: Socio-Legal Scholarship in an Age of Disenhancement; Julia J.A. Shaw .- 7. Transnational Legal Processes and the (Re)construction of the \'Social: The Case of Human Trafficking; David Nelken.- 8. Addressing a \'Globalised Social\': Mobilization of Law in Global Networks with Reference to Biofuel Production in Indonesia; Jacqueline Vel and Adriaan Bedner.- 9. Social Practice and Socio-Legal Studies; Hilary Sommerlad.- 10. The Gendered \'Socio\' of Socio-Legal Studies; Rosemary Hunter.- 11. Queer Sociality; Sally R. Munt.- 12. Bringing Society to Law: A Critically Raced Accounting; Francisco Valdes.- 13. From Responsible Saver to Stewarded Investor? ; Sally Wheeler.